In the previous article, we have seen how to benefit from the new wimboot feature of MS Windows 8.1 using the DISM command. Thanks to the free/opensource WimLib, let’s now see how we can proceed with the capture/apply phase. This WimLib method will be similar to the DISM one. Since Wimlib 6.3, you no longer need a Windows 8.1 Update 1 source which means you can use any Winpe 3/4/5 version ! Note : e:\ is a second partition on my hard drive. Note : wimlib binaries are in x:\extra\wimlib if you used QuickPE. Note : before step 5, you may want to perform the following command wimlib-imagex update install.wim 1 --command="add CustomWimBootCompress.ini \Windows\System32\WimBootCompress.ini" in order to fully apply bootmgr files (and not use pointers to the wim file). This applies only if you have one unique boot & system partition which is nowadays rarely the case as Windows always created a hidden/reserved partition for the boot files. And voila, you should end up with a C drive occupied by only 250 MB (before 1st boot where pagefile.sys and hyberfil.sys will be created). In April 2014, MS has updated Windows 8.1 to Windows 8.1 Update 1. (buildlab 6.3.9600.17031 and up). One feature which was not very much marketed was the Windows Image File Boot also named Wimboot. You can read more here on MS Web site. Windows image file boot (WIMBoot) lets you set up a PC so that it runs directly from a compressed Windows image file (WIM file). 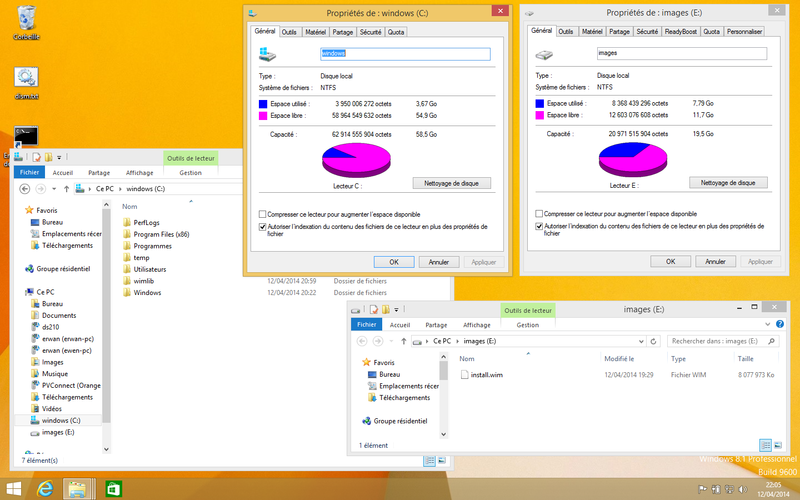 WIMBoot can significantly reduce the amount of space used by Windows files. 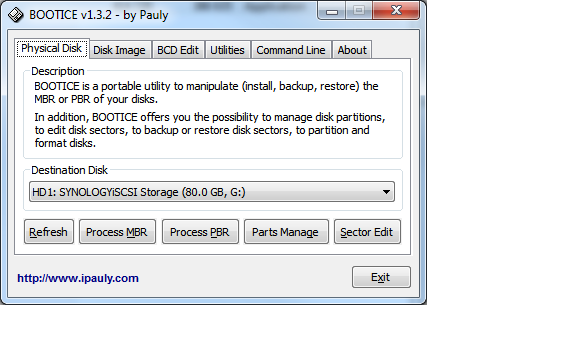 This helps you provide more free space to users, and helps you manufacture Windows on PCs with smaller drives. We’ll assume you have already installed your Windows 8.1 (You can download an evaluation version here). 1-Lets make a WINPE out of the Windows 8.1 update 1 iso/dvd (I use QuickPE). Note : after step 5, I had to do a bcdboot X:\windows /s X:\ where X is the partition where you just applied your WIM file. And voila, you should end up with a C drive occupied by only 3GB (when it was about 20GB minimum before step 1). This should work on X86 or X64 (tested), with a UEFI or MBR (tested) partition, with SSD drive or standard drive (not tested). Here below a picture showing my final / wimboot setup. 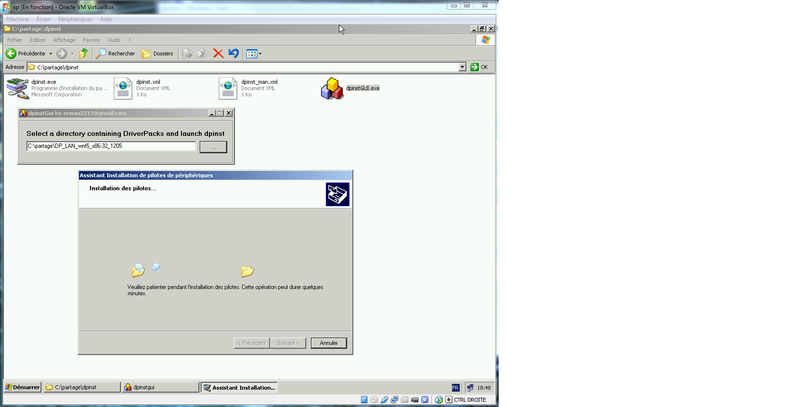 Lately I had cloned a physical XP installation to run it into VirtualBox. It went fine except for the network drivers. Rather than looking for the right driver over internet (which can be a painful process sometimes) I decided to use DriverPacks and dpinst from Microsoft. 1-Download the proper driverpack (lan, wlan, storage, etc) for the correct O.S (nt5,nt6,x86,x64). 2-Unzip it to a folder (c:\drivers for exemple). Note1 : I mounted my disk image offline to inject my files. Note2 : for a physical machine, best would be to stuff it all on a USB key. 3-And run dpinst from the command line (dpinst /path c:\drivers) OR use my GUI (here) to make it easier. Native VHD boot is supported. These are nice alternative for old hardware and/or to setup a quick rdp/web/setop box computer. Another useful tool to install any windows (from xp to w2kr8) from WinPE (or any win32 environement). 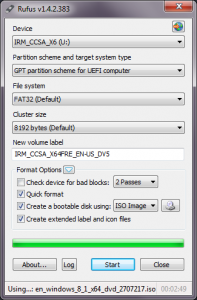 One can also install win7 and up to a usb drive or vhd drive. 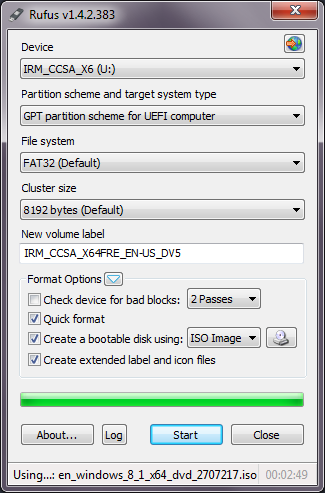 Useful too to install Windows7 from WinPE (or any win32 environement) but also to install Windows7 onto a USB disk.